Advanced Road Design V15 Released! Civil Survey Solutions is pleased to announce the release of Advanced Road Design V15 for Civil 3D 2015 & AutoCAD 2015. 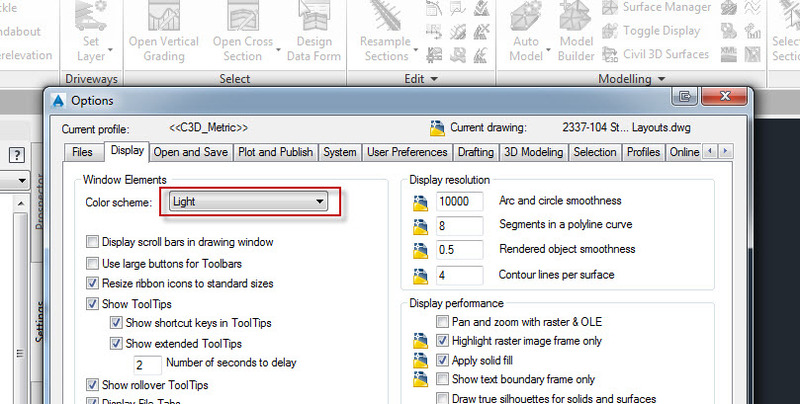 Advanced Road Design V15 extends on the fully dynamic design drafting environment of Advanced Road Design V14, working inside the 2015 Autodesk product release. The new release of Advanced Road Design V15 is only compatible with Civil 3D 2015 and AutoCAD 2015 at this time. 2. Go to the ‘Display’ tab and change colour theme from “dark” to “light”. We will be creating some new icons that will display well with the dark theme in the near future. In this video, we look at a process for sharing your Advanced Road Design models to Autodesk Infraworks, including assigning materials for the different areas of pavement, kerb, footpath, batters, etc. This gives you the opportunity to incorporate Advanced Road Design into your BIM workflows, as well as quickly visualising your designs for analysis and communication with your stakeholders. We are currently working on a more automated process for exporting Advanced Road Design data to Autodesk Infraworks. The multi-section batter command allows users to create intelligent batters. Depth checks are used to determine how the batter is to be formed, so that designers can control what happens in heavy cut/fill situations. This introduction into multi-sections batters shows how a Gabion Wall can be easily created.